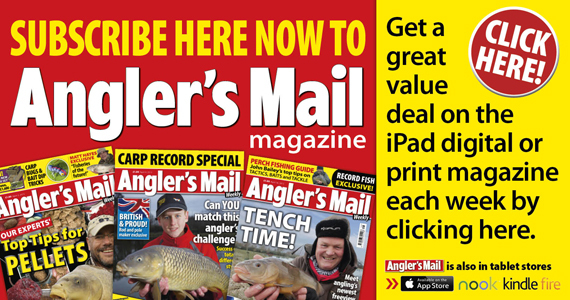 Be sure to get this week’s brilliant new issue of Angler’s Mail magazine! 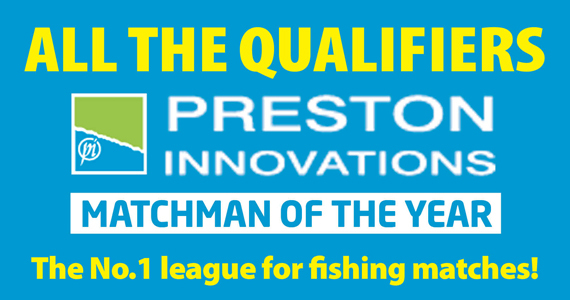 Preston Innovations Matchman of the Year qualifiers. September 28/29. * Bannister House, Match Canal, Merseyside. Sun, 37. John Vernon (Elton Tackle) 157-14-0, carp to 9 lb, 6mm pellet, 3m & margins, peg 21; Barry Helliwell (Rochdale) 95-0-0; Alan Menzies (Elton Tackle) 75-12-0; Steve Burgess (Garbolino Elton) 69-0-0; Lee Murphy (Ted Carter) 66-0-0; Martin Kaye (Elton Tackle) 57-8-0. * Blundell’s, nr Warrington, Cheshire. Sat, 40. Kieron Rich (Daiwa) 210-13-0, carp to 5 lb, meat, 13m and 9m, peg 75 Pine; Cliff Noble (Stalybridge Angling Supplies) 109-3-0; Mike Billingham (Bag’em) 92-6-0; Keith Leatherbarrow (St. Helens Angling) 87-14-0; Stuart Carroll (Leigh Tackle & Bait) 82-11-0; Derek Wood (Hazel Grove Angling Centre) 82-2-0. * Brookside, Snake Pit, Cheshire. Sun, 31. Karl Lane (Preston AC) 60-10-0, F1s to 2 lb, meat on deck at 6m, peg 57; Mark Plevin (Deggy’s Tackle) 54-12-0; Dave Williams (Fisherman’s Way) 50-4-0; Peter Lowry (Stalybridge) 42-8-0. * Hall Lane, Bess’s Lake, Lancashire. Sun, 42. Andy Bennett (Daiwa/Guru/Bait-Tech) 111-8-0, carp to 3 lb, maggot, 13m, peg 69; Steve Parry (Daiwa Guru) 80-0-0; Mike Reed (Garbolino Elton) 78-0-0; Frank Yardley (Ted Carter Preston) 66-12-0; Simon Sheppard (Ted Carter Preston) 56-9-0; Andy Bridge (JRS) 54-8-0. * Heronbrook Fisheries, Slindon, Staffs. Sun, 83. Clive Nixon (Maver Gold/Bag’Em) 119-2-0, carp to 8 lb, poled meat at 5m and over, peg 26; Darren Heath (Maver Pickering’s) 117-8-0; Kevin Dennis (Ultimate Pellet) 117-0-0; Steve Openshaw (Lingmere) 112-1-0; R. Buxton (Maver Midlands) 107-14-0; Craig Ebbrell (Maver Midlands) 104-15-0. * Jeff Moors Memorial, Cudmore Fisheries, Whitmore, Staffs. Sat, 80, Arena, Suez, Panama and Pool 1. John Newton (Ashton AS) 70-4-0, carp to 6 lb plus a few ide, poled pellet over and in margins, Suez peg 30; Jon Arthur (Pole Fishing/Maver Midlands) 69-10-0; Darren Heath (Maver Pickering’s) 68-8-0; Jamie Howarth (Maver Midlands) 68-4-0; Jack Robinson (Maver Pickering’s) 67-10-0; Trev Robinson (Maver Midlands) 66-8-0. £750 raised for charity. * Partridge Lakes, Culcheth, Cheshire. Sat, 50, Covey. Andy Geldart (Garbolino/Dynamite Baits) 94-2-0, F1s, pellet shallow, 12m and 6m, peg 102; Chris Weeder Jnr (St. Helens Tackle & Bait) 90-1-0; Ian Burley (North West Baits) 89-11-0; Wayne Nolan (Partridge Lakes) 88-0-0; Andy Bennett (Daiwa/Guru/Bait-Tech) 81-0-0; Mark Lucas (Mosella) 75-4-0. Sun, 75. Covey. Peter Southall (Track) 96-9-0, F1s and mirror carp to 8 lb, worm, pole 7m down track and 3m in margin, peg 42; Lee Thornton (Bag’em) 96-9-0; Kieron Rich (Daiwa) 95-0-0; Andy Bridge (Garbolino Elton) 93-6-0; Connor Barlow (Drennan NW) 75-0-0; Mark Lucas (Mosella) 74-9-0. * Wigan DAA, Leeds-Liverpool Canal, Gorse Lane, Lancs. Gareth Charnock (Liverpool AS) 6-2-0, roach, hemp at 16m, pegged in woodyard; Colin Cliff (Ted Carter Preston) 5-6-8; Darren Price (Tri-Cast Rochdale) 4-7-8; Les Williams (Hindley MG) 4-2-8; Graham Mortimer (Hindley MG) 3-15-8; Brian Mercer (Chorley Socials) 3-6-0. * Wigan MG Teams of Four, Leeds-Liverpool Canal, Heaton’s Bridge, Lancs. Sun, 76. Steve Clegg (Saints) 12-13-8, skimmer bream, perch to 1 lb 8 oz and a bonus F1 carp, maggot over groundbait, 11m; Dave Denton (Ted Carter White) 10-7-12; Mark Grimshaw (Mosella NW White) 8-9-8; Laurence Clayton (Hindley MG) 8-7-8; Rob Porter (Mosella NW Black) 8-4-4; Tom Barlow (Maver NW Black) 8-3-0. Teams: Saints 11; Wigan MG Green 20; Sensas NW Red 25; Wigan MG Blue 28; Maver NW Black 28. League: Wigan MG green 34; Saints 39; Wigan MG Black 46; Sensas NW Red 54. * Wirral Winter League, Trent & Mersey Canal, Northwich, Cheshire. Sun, 36. Damian Parry (Browning Lifestyle Red) 11-2-1, mainly roach to 10 oz, poled caster and maggot; Tim Robinson (Frank’s) 6-15-1; Steve Dudley (Browning Lifestyle Blue) 6-10-0; Keith Hulland (Team Eclipse) 6-6-15; George Cooke (Frank’s) 5-13-0; Gary Billings (Cheshire MG) 5-12-5. Teams: Browning Lifestyle Red and Browning Lifestyle Blue both 26; Team Guinness 21; Frank’s 20; Team Eclipse 18; Cheshire MG 16. Blundell’s, nr Warrington, Cheshire. Wed, 27. Cliff Noble (Stalybridge Angling Supplies) 100-12-0, ide, mirrors and F1s to 3 lb, maggot shallow at 7m and meat in margins, peg 59 Trio; Darren Gleave (Trafford Angling) 98-6-0; Ian Ridgeway (Rochdale Angling Centre) 95-0-0; Simon Fadden (Frenzies) 92-11-0; Mitch Rawlinson (Fishing Republic) 91-0-0; Kieron Rich (Daiwa) 85-2-0. Sun, 16. Cliff Noble (Stalybridge Angling Centre) 101-6-0, mirrors, skimmers & ide, maggot shallow, 11m, peg 31 Trio; Noel Dean (Elton Tackle) 98-15-0; Danny Maguire (Mosella) 92-6-0. Brookside, Snake Pit, Cheshire. Thurs, 18. Karl Lane (Preston AC) 115-2-0, F1s, meat, 6m, peg 4; Ray Thompson (Vale Royal Angling) 94-8-0; Tom Barlow (Maver NW) 79-2-0; Andy Butler (Mosella) 74-0-0; Paul Burton (Manchester) 67-6-0. Sat, 23. Steve Conroy (Drennan) 61-8-0, F1s to 3 lb, pellet, 7m, peg 38; Richie Dean (Avago Tackle) 57-10-0; Stuart Conroy (Kamasan) 56-8-0; Tom Barlow (Maver NW) 51-8-0; Andy Butler (Mosella) 50-12-0; Adam Harman (Cheshire Angling) 49-2-0. Firswood Road, Latham, Lancs. Wed, 18. 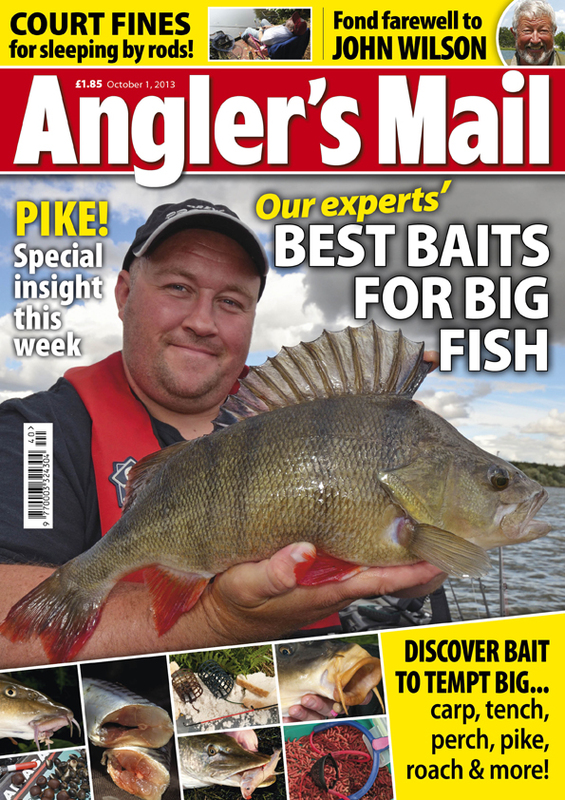 Peter Tickle (St. Helens) 74-6-0, carp, white maggot, 13m, Peg 11; Steve Rimmer (St. Helens Tackle & Bait) 57-8-0; John Carroll (Firswood) 54-6-0; Chris Picton (St. Helens) 52-4-0. Hall Lane, Bess’s Lake, Lancashire. Thurs, 16. Bruce Peggs (Ted Carter Preston) 101-12-0, carp to 3 lb, red maggot, 4m, peg 48; Peter Richmond (Ted Carter’s Preston) 90-10-0; Graham Carter (Ted Carter Preston) 83-14-0. Sat, 22. Bruce Peggs (Ted Carter Preston) 79-10-0, common carp, maggot, 11m, peg 67; Mark Halliwell (Bag’em) 69-8-0; Dave Ford (Wigan) 68-12-0; Mike Hammond (Ted Carter Preston) 66-8-0. Hampton Springs, Malpas, Cheshire. Tues, 21, over-50s. Jim Standish (Tyldesley Anglers) 100-1-0, carp and skimmers, meat, margins & 6m, peg 28 Rock Pool; Ian Hughes (Egremont Ferry) 99-13-0; Chris Hughes (Deggy’s Tackle) 60-8-0; Peter Hodge (Hampton) 60-7-0. High Heyes Farm, Eccleston, Lancs. Sat, 27, Lake 3. Dave Rose (Izaaks MG) 51-4-0, barbel and carp, maggot, 14m, peg 35; Alex Feeney (Matrix Wayne’s Tackle) 39-0-0; Dave Denton (Ted Carter Preston) 35-4-0; Dave Bolton (Coppull Anglers) 31-0-0. Hodnet AC, Shropshire Union Canal, Soudley. Sun, 19. Steve Broome (Bilston AC) 7-5-0, mainly perch, poled chopped worm, peg 9; Keith Cummings (Birkenhead Centre) 4-15-0; Carl Westwood (Four Ashes) 4-2-0; Dave Richards (Four Ashes) 3-15-10; Ray Bates (Hodnet) 3-3-0. Lingmere, Match Lake, Cheshire. Wed, 23, OAPs. Terry Nolan (Lobol) 40-2-0, carp and silvers, maggot, peg 4; Richie Hughes (Jacobs) 37-4-0; Ian Hughes (Egremont Ferry) 36-2-0. Sat, 19. Carl Fletcher (Lingmere) 77-8-0, carp and F1s, maggot, 8m, peg 30; Colin Doran (Widnes AC) 56-9-0; Phil Henry (Fisherman’s Way) 50-11-0. Liverpool DAA, Leeds-Liverpool Canal, Pilling Lane. Sun, 17. Mike Dixon (Liverpool Dockers) 8-10-0, skimmers and roach, hemp and bread, 11m; Jeff Stirrup (Ted Carter Southport) 5-2-0; Ken Smith (Liverpool Dockers) 2-2-0; Paul Charnock (LAS) 2-8-0. Meadow View, Lark Pool, Cheshire. Tues, 20, OAPs. Phil Barwell (Widnes AC) 51-0-0, carp to 5 lb, pellet, 14.5m, peg 14; Michael Bell (Lionel’s) 35-12-0; Kevin Mackintosh (Gilders Tackle) 34-8-0; George Osborne (Penketh Angling) 29-4-0. Thurs, 18, OAPs, Thrush Pool. Ken Jefferies (Edgeley Sport) 32-12-0, carp to 4 lb, pellet, 10m, peg 3; Phil Barwell (Widnes AC) 28-4-0; Eric Whitely (Paul’s Tackle) 24-0-0; Steve Leaff (Meadow View) 15-4-0. Sun, 23. Martin Stokes (Twangers) 68-0-0, carp to 6 lb plus silvers, Method feeder, maggot, peg 32; Shaun Woodward (Danny’s Tackle) 63-8-0; Dave Hancock (Meadow View) 59-8-0; Kevin Richards (Meadow View) 48-12-0. Mill House, Mescar Lake, Merseyside. Wed, 17. Stan Phillips (Liverpool Dockers) 76-2-0, carp to 12 lb, worm over hemp, 12m, peg 55; John Easton (Liverpool AS) 73-0-0; Toby Gill (Mescar Scoopers) 68-12-0; Colin Craven (Bob’s Tackle) 54-6-0. Sat, 23, All Winners Final, Mistral Lake. Toby Gill (Mescar Scoopers) 87-4-0, carp to 10 lb, worm over hemp, 10m, peg 60, won £350; Alex Bentley (Rays Tackle) 50-4-0; Paul Haines (Kirkby) 39-0-0; Matty Higgins (Maghull) 38-0-0. Sun, 17, Mistral. Dave Cheatham (Birscough Angling) 75-14-0, carp to 12 lb, worm, Method feeder at 20m, peg 50; Ken Dooley (Liverpool AS) 73-14-0; Mick Woolvine (Ted Carter Southport) 71-12-0; Andrew Molyneux (Mescar Scoopers) 67-0-0. Newton-le-Willows AA, Sankey Canal, Penkford Bridge. Thurs, 20, over-60s. Frank Holden (Liverpool) 12-6-0, bream and roach, hemp and caster, 12m, peg 7; John Mac (Whiston Angling ) 9-2-0; Dennis Bate (Warrington) 7-7-0; Eddie Cook (Warrington) 6-7-0. Fri, 20, White Door Dam, Lancs. Krystian Bryan (Golborne) 23-8-0, carp, chub, tench and skimmers, pellet, 11m, peg 1; Eric Kirkby (Whiston) 3-4-0; John Arnold (Golborne) 3-2-0. Sun, 20, Sankey Canal. Terry Speakman, (Newton-le-Willows) 20-13-0, bream, worm and caster, 10m, peg 52; Ray Shorrocks (Farnworth) 13-2-0; Tim Griffiths (Ashton- in- Makerfield) 9-14-0; Eddie Cook (Warrington) 6-6-0. Northwood Garden Centre, Hanchurch Fisheries, Stoke-On-Trent, Staffs. Sun, 16, Model Canal. Danny Lowndes (Hanchurch Silver) 65-15-0, carp, poled red maggot, peg 14; Steve Michaels (Tri-Cast Highfield) 62-9-0; Peter Green (Hanchurch) 61-9-0; Chris Parker (Pickering’s of Burslem) 55-15-0. Old Hough, Warmingham, Middlewich, Cheshire. Tues, 12, Prospect & Lucky Dip pools. Ian Mellor (Wyche Anglers) 46-1-0, carp and silvers, poled pellet; George Connor (Old Hough) 45-13-0; Barry Holmes (Old Hough) 30-11-0. Thurs, 15, Boulders & Goose. Frank Bradley (Old Hough) 47-10-0, carp and silvers, poled pellet; Ian Cox (Gilder’s) 27-7-0; Steve Price (Old Hough) 26-4-0; John Pearson (Gilder’s) 25-5-0. Sat, 10, Upper Benbo. Steve Michaels (Tri-Cast) 55-10-0, carp and silvers, poled pellet; Tony Palios (Old Hough) 41-1-0; Anthony Cotton (Old Hough) 40-15-0. Partridge Lakes, Culcheth, Cheshire. Mon, 25, OAPs, Spay, Marsh & Ribbon lakes. Chris Weeder snr (St. Helens Tackle & Bait) 67-5-0, F1 and mirror carp to 7 lb, white maggot, 4 m, peg 4 Spay; Dave Timmins (Gilders Tackle) 48-11-0; Graham Broughton (Bait-Tech) 48-2-0; Roy Powell (Leigh Tackle & Bait) 47-10-0; Gordon Fielding (Leigh Tackle & Bait) 47-9-0. Tues, 23, Covey. 23. Mick Reed (Garbolino Elton) 123-7-0, F1s and mirrors, pellet over micro pellet, 3 and 4m, peg 42; Andy Bennett (Daiwa Guru/Bait-Tech) 122-3-0; Ian Burley (North West Baits) 105-3-0; Steve Openshaw (Lingmere) 91-15-0. Wed, 62, OAPs, Covey. Phil Oaks (Garswood Hall) 119-9-0, F1 carp, poled pellet at 4m, peg 72; Des Greenhough (Partridge Lakes) 100-12-0; Dave Olly (Olly Motors) 99-10-0; Tony Mayo (Partridge Motors) 86-0-0; Tommy Aspinall (Atherton Tackle) 81-5-0. Thurs, 29. Andy Bennett (Daiwa/Guru/Bait-Tech) 194-13-0, F1s, maggot shallow, 6m, peg 42; Mike Rogerson (Drennan NW) 138-0-0; Ian Burly (NW Baits) 137-15-0; Dave Timmins (Gilders Tackle) 114-2-0. St. Helens AA, Carr Mill Dam, Merseyside. Mon, 24. Lee Addy (Drennan NW/Bait-Tech) 18-14-0, roach and hybrid, maggot, 11m, peg 79; Dennis Knight (Wigan) 12-0-0; Gedd Rigby (St. Helens) 11-8-0; Alan Birchall (St. Helens) 10-6-0. Sat, 28. Lee Addy (Drennan NW/Bait-Tech) 24-2-0, roach, bronze maggot, 7m, peg 54; Paul Swift (Bolton) 18-7-0; Derek Bennett (Preston Innovations/Saints) 18-1-0; Phil Holland (St. Helens) 14-3-0. Stoke City DAS, Shropshire Union Canal, Norbury Junction, Staffs. Sat, 15. Nige Clayton (Browning Lifestyle) 10-14-2, skimmers, roach and perch, poled caster, peg 75; Jamie Edgerton (Wolverhampton AA VDE) 10-0-8; Neil Turner (Wolverhampton AA VDE) 8-5-8; Terry Blyde (Lazy Hill) 6-13-0. Wigan DAA, Leeds-Liverpool Canal, Martland Mill, Lancs. Wed, 30. Alan Whalley (Gilders Tackle) 10-5-0, roach to 12 oz, bread punch, 11 and 13m, peg 110; Tony Prescot (Chorley Socials) 7-12-0; Gary Marchant (Mosella NW) 6-13-12; Sean Wharton (Gilders Tackle) 6-11-0.